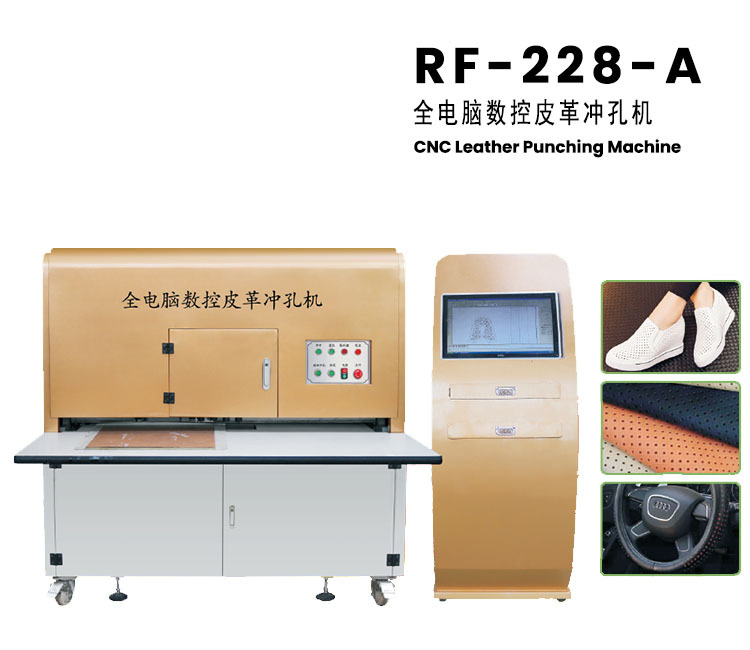 Mainly used for punching vamps, bags and other materials, punching 1-6MM thick PU, PVC, cloth, leather and other materials with high punching efficiency, stable mechanical properties, easy to use software. 1. Leather is not black or smelly, instead of laser. 3. The machine adopts the configuration of servomotor + screw guide rail, and the whole machine structure (whole cutting, no welding), the performance is stable, to ensure. B the accuracy can reach ±0, 1mm. C the impact force of a single punch can be up to 1 ton. D can be punched 0.8~12MM holes, can be punched 6MM thick materials. The impact force is stable, not because the hole is big or the material is thick, the impact force is insufficient, cannot punch through the phenomenon. 4. Flexible plate changing, no laying time, double efficiency, each machine is equipped with 2 perforated frame plates. When one frame plate is punched, the other one is used for manual material laying, the two steps are carried out simultaneously, and the two frame plates are reused. This kind of structure, do not need to stop to lay the material, the efficiency is increased twice. 5. Vacuum system, clean and tidy working environment. A as the holes are punched, the waste is sucked away, so that no scrap falls on the leather material being punched, creating a barrier and causing impenetrability.